A $1.3 million contract has been awarded to Hard Rock Construction LLC, which in January will begin refurbishing the pedestrian bridge — one of the oldest bridges in the city. Crews will clean and paint it, seal cracks in the substructure and replace some of the decking, beams and other structural components. The Magnolia Bridge was built in the late 1800s and originally included streetcar tracks. 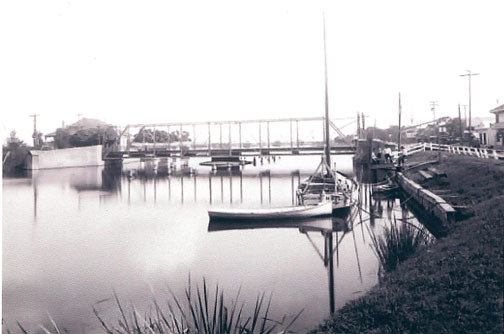 As a swing bridge, it had a center piling that allowed it to rotate, turning the bridge parallel to the waterway so that boats could pass on either side, though the bayou was closed to river traffic in the early 20th century. The bridge was restored and stabilized in 1937 and again in more recent decades, though it’s unclear when it was converted to being strictly for pedestrians. These days, numerous walkers, joggers and cyclists cross the bridge, while neighbors often sit on on its decking among the peeling beams. Photographers shoot pictures of and from the bridge, which has been the site of more than a few weddings. The cost of the work is being shared by the city’s Department of Public Works, the Regional Planning Commission and federal funding through the state Department of Transportation and Development. Mary Jo-Webster, who founded the group Re-Bridge about seven years ago to rally support for rehabilitation of the Magnolia Bridge and the nearby Dumaine Bridge, said she is glad to see the project finally move forward. Unlike the Magnolia Bridge, the Dumaine Bridge’s issues are only cosmetic, not structural, so Webster said the bulk of the money the group raised will likely be used for that work when it happens. She said the city recently informed her it is working on a cooperative endeavor agreement for that project. Webster said the community is going to handle the spot painting and graffiti abatement on the Magnolia Bridge after the rehab project is complete. This super-casual class is perfect for hoop beginners! It’s a low-impact, total body work-out. It’s fun, and easier than you think! We’ll practice basic on-body and off-body hoop moves. Handmade, adult-sized hula-hoops are provided. No registration needed, just come! Kids are welcome. We’ll be by the swings and playground equipment. If you are determined to make your neighborhood a better place, the information below is great reference material. The citizens of New Orleans are faced with an epidemic of crime that threatens to undermine the future of our city. This rising tide of violence diminishes opportunities for our children. In many ways, the public safety problems we are faced with today are a result of missed opportunities. With large segments of our community unable to access economic opportunity, quality education, or mental health and drug treatment programs, widespread crime comes as little surprise. While our police force works to gain capacity, many residents feel as if they have been left on their own to handle an urgent crisis. As community-members, we may not have the resources to solve each of these deep-rooted problems. However, there is much we can do at the local level to make progress. We can and will rise to the challenge of reducing crime and improving our communities. These tools for public safety were selected because each requires little or no government assistance. In other words, they can be implemented by the community quickly and at low cost. Each of the sections was authored by a community group that has implemented a program with success right here in New Orleans. Every community is different—each neighborhood faces slightly different issues and has different resources for addressing public safety problems. The Toolkit was designed to provide a menu of options. A community might like to implement any number of these programs, in any order. Together, we can build a city where every resident is Safe on Our Streets. parcel-fee vote. On November 2, 2010, Broadmoor voters approved funding the improvement district for five years through an annual $100 parcel fee. This was reapproved in 2015 for another five years. strategic crime camera installations, blight clean-ups and small infrastructure improvements. entry points in order to capture activity. 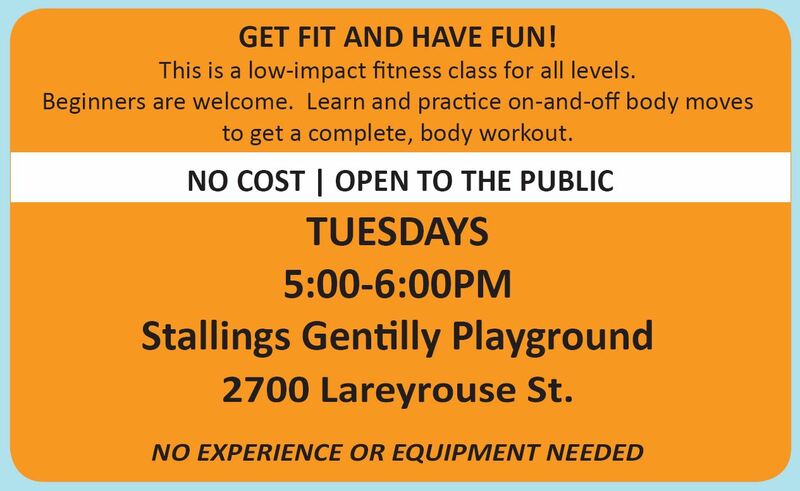 the community including faith-based partners, Keller Library and Community Center, Wilson School, South Broad Community Health and the business community. WHAT IS A SECURITY DISTRICT? New Orleans Police Department in providing for public safety. HOW IS A SECURITY DISTRICT CREATED? ARE THERE OTHER SECURITY DISTRICTS? HOW IS A SECURITY DISTRICT FUNDED? As political subdivisions of the state, Security Districts have the right to impose property taxes. HOW DO SECURITY DISTRICTS OPERATE? HOW MUCH DOES A SECURITY DISTRICT PATROL COST? $75,000 per year to $600,000 per year depending on the scope of services. WHAT SERVICES DOES A SECURITY DISTRICT PROVIDE? they load or unload groceries. DO SECURITY DISTRICTS IMPROVE PUBLIC SAFETY? WHAT ABOUT A “COMMUNITY IMPROVEMENT DISTRICT”? community development needs such as youth programming, park maintenance and other improvements. Taxing District” report from September 23, 2013 on the inspector general website at nolaoig.gov. 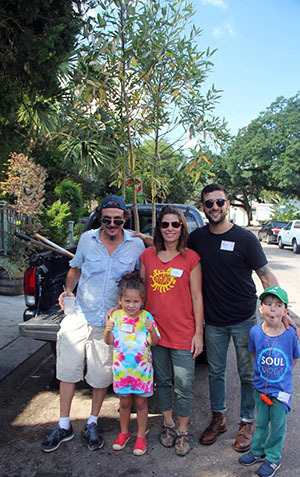 In 2012, Zion City organized their neighborhood residents to look at how to improve their community. Below are the 6 steps used from start to finish. 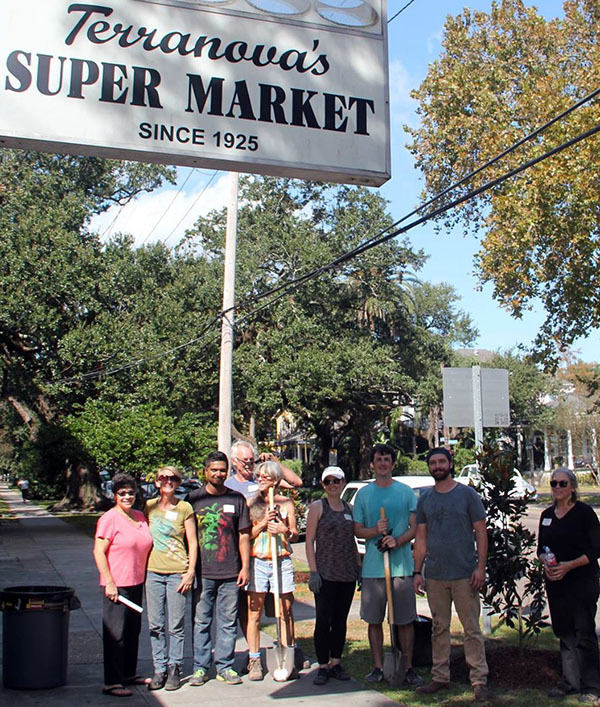 Community mapping assesses the number and type of blighted properties, and monitor progress towards improvement. blighted properties cheaply if the owners wouldn’t maintain them. work with the group to execute the project. conditions. The target date is 30 days from the complaint to the inspection. may look at http://www.nolaassessor.com/ to find owners of properties in New Orleans. hazardou conditions of public nuisance and blight. The city has 3 paths for abatement. conditions. 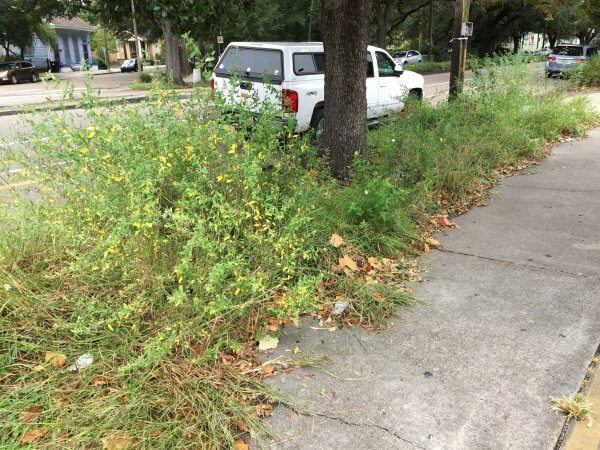 The City cutting the grass will not remove fines against the owner. is for sale. Email chapter66@nola.gov and we’ll make note that you are interested in purchasing. boundary with a NORA owned property to purchase that property. Go to http://redevelop.nola.gov/ or call 504.658.4422 to complete LND 3.0 expression of interest forms. It is a first come first served process. All Lot Next Door properties are sold for at least fair market value. ProjectNOLA enhances public safety by dramatically increasing police efficiency and citizen awareness. Managing the largest HD city-wide networked crime camera system in America, ProjectNOLA’s Incident Monitoring Center receives video from 1400 cameras placed on New Orleans homes and businesses. Routinely providing real-time supplemental information and video footage to officers, ProjectNOLA has assisted with over 500 criminal investigations, including 50 homicides. grant money or city tax dollars. review their own video, for any reason and at any time. 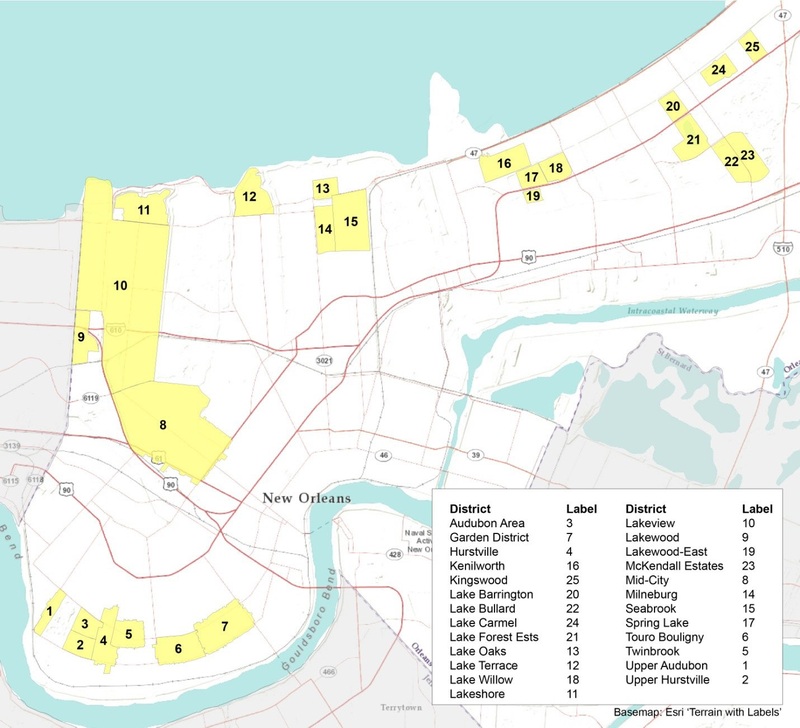 For those wishing to get more than one or two ProjectNOLA crime cameras—free of charge—Project NOLA may help design a professional grade HD camera system for homes and businesses, point out where the system may be purchased from a reputable merchant for a great price, and suggest a local installation company that will install it for a special discounted price. opportunity to proactively look for felony crimes in progress. 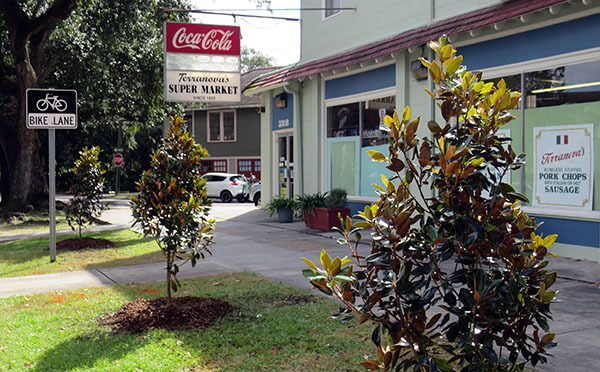 Business and homeowners along the Freret corridor found that they could affordably install crime cameras on their own. By purchasing “DIY” systems through a wholesale company or online, many property owners have been able to quickly establish a monitoring system. The more properties with cameras, the larger the area that could be monitored. When the property owner purchases and installs the camera system, they have 24/7 access to footage no matter what the severity of the incident is, and no proof of police reports needed. Plus, they can easily connect their system to NOPD’s SafeCam program. Neighborhoods often feel helpless in the face of crime issues, but there are activities that promote social cohesion and sense of community. 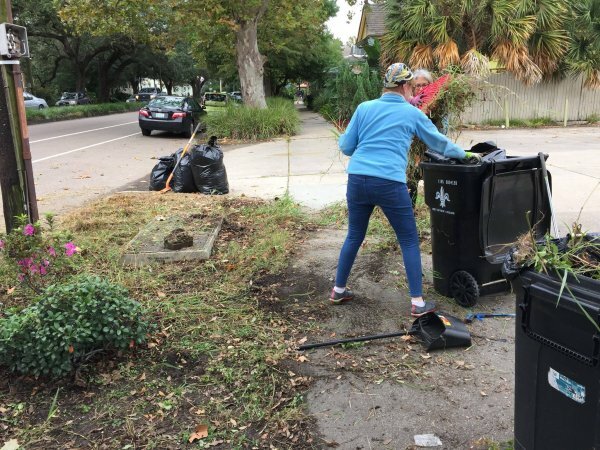 Picking up litter improves the appearance of the neighborhood and is an activity where neighbors connect with one another in a positive context. This is an activity that helps diminish the environmental factors that contribute to crime. 1. Identify an area in your neighborhood that needs to be cleaned up. 2. Find a few community members who you can count on to help clean the area up. 3. Figure out what equipment or resources you need to be successful. 4. Schedule the event & invite other neighbors to participate. 5. Host the clean-up event. Prioritize safety of participants! 6. Document the event & share your success! 7. Plan your next clean-up event. activity members of the community look forward to. Find an intersection or a park that has a litter problem and focus on just one area for each event. locations ensure the community can see clean ups taking place and can easily see the result and impact of the clean up. • Don’t go on private land without permission. or in the neutral ground. • If someone’s house has a lot of trash, report them to 311, don’t go into their yard! • Lowest traffic is on Saturday and Sunday mornings, and that makes clean-ups safer. • Highest traffic is after work on weekdays, making clean-ups more risky. • Most volunteers will drive to the clean-up. Think about where they’ll need to park. • Pick locations where it is easy to pick up trash. Harder locations require special tools. • Is there high grass & weeds? Litter is harder to pick up in overgrown areas. is harder to pick up, and may require special tools. community members who you know are going to participate and encourage others to join in. • Get a core group of neighbors who are physically able to do this work. Who will show up and clean up even if everyone else forgets? These people are your core group. are willing to do activities together, give them an activity! Councilmember, they may know other groups nearby trying to plan clean-ups too. aluminum for recycling, get some regular white kitchen bags. local hardware store if your neighborhood group has any sort of budget. pick out the best time for the most people. Weekend mornings, especially Saturdays, seem to be a great time for a lot of people. you’ve never done this, start off with short, 1 hour clean-ups. Summer you may consider starting much earlier to beat the heat. • Tell them in person at community meetings, church services, or other gatherings. organization and get to know neighbors. •Set up the Event through social media such as email, Facebook, or Nextdoor. Pro-tip: create Facebook event and use the link as your main event invitation across other formats. never realize it until you do it. • There’s easy litter (quick to clean up) and hard garbage (mattresses, tires, busted furniture). Go after the easy stuff and call the city 311 to report the big stuff. • Some garbage is sharp and will cut through the skin. This is the biggest thing to watch out for. unless you know there’s nothing sharp. • If you want to clean up broken glass (there’s always broken glass), use a broom & dustpan. Picking it up with your hands (even with gloves) can cause cuts through the skin. & don’t sling it over your shoulder. Sharp stuff can cut through the skin even inside a bag! • Use tools like a rake, broom, trash grabber, dust pan, shovel, etc. Your back will thank you! you pick them up. This prevents gross liquid from splashing. • If you find a bottle with an apple-juice colored liquid in it, it probably isn’t apple juice. • Watch out for rusty nails. • Have hand sanitizer at the ready. won’t notice till you’re sick later on. • Watch out for ant beds, stinging insects, or other bugs underneath some trash. street so Sanitation can schedule to pick it up. Report to 311 or Sanitation that your neighborhood hosted a clean-up, and tell them where the pile of bags is located. The city does not recycle glass. Glass goes in the trash bags with the other trash. up immediately if you see lightning or hear thunder nearby! may be someone else’s treasure. or arms into the storm drains. The lids are very heavy & require special tools to open safely. DOCUMENT & SHARE YOUR SUCCESS! social media and with other people in the neighborhood. 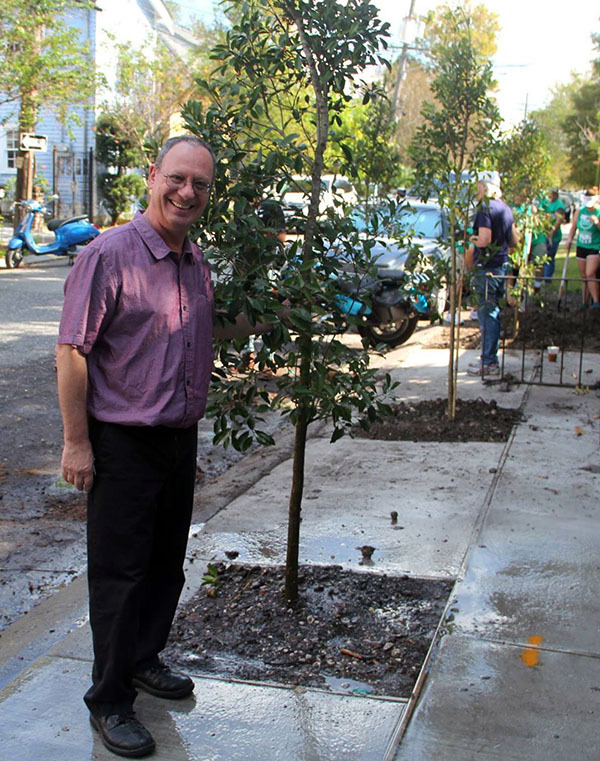 Sanitation, and your City Councilmember. 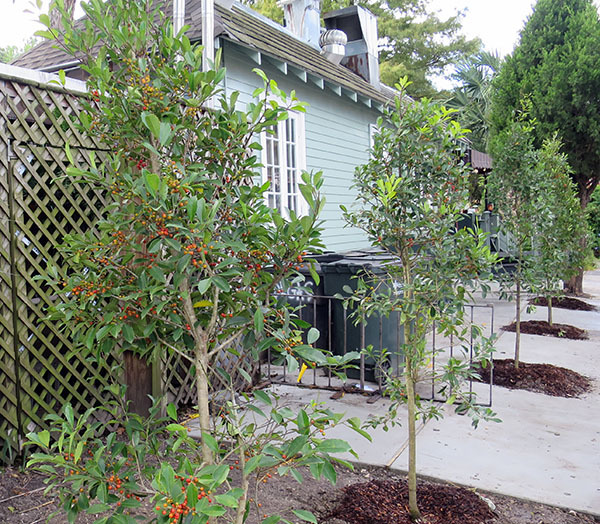 Build off your success and get the neighbors together for this activity again and again. the number and exact location. streetlights that are broken or missing. the time and date of your call and subsequent call or emails. respectful of your Council Member’s time. Remind your Council Member that this is a public safety issue as well as an aesthetic issue. afternoon event in the parking lot of a prominent business on the Avenue. had with DPW, Council and any other city agencies. Also bring yard signs and bumper stickers. Include any website or social media interactions. the media who covered the story and thank them. Gratitude is important at all levels. are a nuisance for neighbors. At the same time, these vacant spaces have an unrealized potential for vibrancy. Along the St.
did and some ideas for how your community might turn vacant into vibrant. minimal commitment from the property owner, and can quickly build the momentum of revitalization in the area. vacant lots that are ripe for commercial development. We paired the food truck operators with the owner of a vacant lot to create a Food Truck Park over four weeks. Each day, the food trucks would pull in and the park would open for customers, complete with picnic seating, family events and a music tent. The empty space because a place for the community to congregate and for small business entrepreneurs to connect with customers. providing a test case for retail businesses to open along the corridor. green spaces. 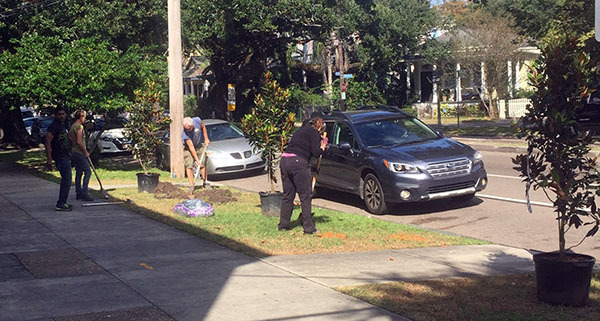 Here is what we did along St. Claude to bring parks to more people. and learn how to design a space to meet their needs. After multiple community meetings and design sessions, we settled on a design that provided green space, seating, bike parking and improved the sidewalks for neighborhood use. The owner committed to keeping the grass cut, and the community committed to keeping it clean and using it for community events. What was one a grass field covered in litter is now a modern park that beautifies the area and brings amenities to the neighborhood. • Ask the community how they would use the lot. As a park, a garden, a community meeting space? benches. 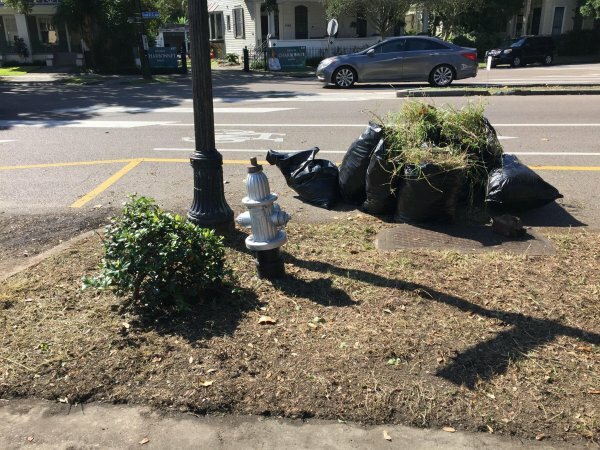 The community should stay engaged in continued maintenance through clean up events. Use the new green space as a place for public events and community celebrations. Before Operation Clean Sweep: education & development was form, if you had a graffiti problem in the city of New Orleans, you would call city hall. Since city hall did not have a department for graffiti, the city transferred you to N.O.P.D. they would have to take the call, and send a unit out to the location. Since police would have to catch vandals in the act, nothing was done, except to fill out the paper work. And, the graffiti stayed on. But most important, it took law enforcement away from priority crimes, to go fill out paper work. 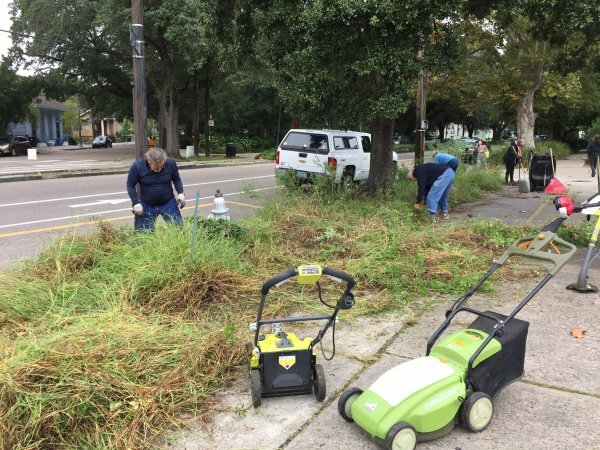 Since Operation Clean Sweep was created, it has saved the New Orleans Police Department from over 9,000 phone calls and eliminated over 25,000 graffiti tags. Operation Clean Sweep is the only non-profit agency that eliminates graffiti for a municipality. Operation Clean Sweep was the official graffiti remover for 2013 Super Bowl & Mardi Gras. Parish Sheriff’s Dept., and the LA. State Police. nuisance, the most important element is patience. neighborhoods, and they would like to know what legal actions and remedies are available to them. conspired, attempted, or abetted anyone to engage in acts adversely affecting the public health or safety. One way to prove the facility contributed to the criminal activity is to show that the owners, agents, or employees of the facility were involved in the criminal activity or had sufficient knowledge of the activity to conclude they were permitting the prohibited activity to occur on the premises. The petitioner must also prove that persons involved in criminal activity outside the location were patrons of that location. In order to avoid dismissal for vagueness, the petition should include specific details of specific incidents with police reports and signed affidavits by all witnesses. Legislature, “Louisiana Laws” link: http://www.legis.state.la.us. 1. Who may file a petition? precinct where the nuisance occurs may petition for an injunction or order of abatement. La. R.S. 2. What is the court procedure once a petition is filed? violation and of a preliminary hearing to be held within 24 hours. La. R.S. 13:4713(B). three-year period. La. R.S. 13:4711(A)(5). involving violence or weapons on or around the premises within the preceding five-year period. nuisance at the location. La. R.S. 13:4713(A). sooner released. La. R.S. 13:4715.
activity and make arrests or issue citations, as appropriate. (3) Municipal authorities prosecute alleged violations and secure convictions. operators–either by City Attorney, D.A., or 10 citizens. 1. Who has the power to prosecute violations of the noise ordinance? 2. What is the court procedure once a business violates the noise ordinance? to continue, it is considered a separate offense. City Code §66-140; City Code §66-141. 3. What are the sound level limits for businesses in residential areas? Lmax (maximum A-weighted sound level allowed) dBA between 7:00 a.m. and 10:00 p.m. From 10:00 p.m. until 7:00 a.m. the sound level limit may not exceed 65 Lmax dBA. The measurement may be taken at a minimum distance of 25 feet from the source being measured within a minimum clearance of 3 feet from any reflecting surface. City Code §66-136; City Code §66-202: Table 1. 4. What type of instrument must be used to measure noise? sound pressure, promulgated by the American National Standards Institute and Testing Procedures. 5. What is considered a violation of the litter and dumping ordinance? on any private property within the city. City Code §66-282(a). permitting the intentional or accidental dumping, leaving, throwing, discarding, ejection, emission, or escape of any vehicle parts, construction debris, furniture, used oil, or other hazardous wastes in any yard, lot, space, building, gutter, drain, or canal. 6. How is a citation for a violation of the litter ordinance issued? affidavit should include a description of the violation, the offender, and any vehicle involved. 7. What the responsibilities of a business owner in regards to litter on premises and sidewalks? rear and alongside the premises. . City Code §66-287. (1) Citizens report noise problems to their neighborhood association. may also apply for injunction against offending business. neighborhood associations or a group of 10 aggrieved citizens? the Board of Zoning Adjustments or to Civil District Court. 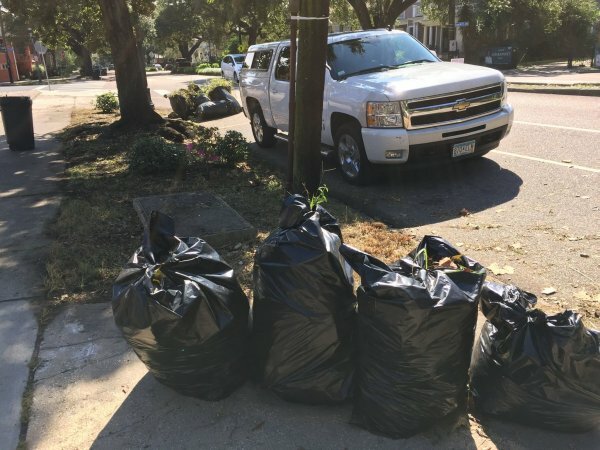 (1) Citizens report litter or dumping violations to their neighborhood association. (3) City Attorney’s Office prosecutes for litter or dumping violations and imposes fines. a. Failing to keep the premises clean and sanitary. La. R.S. 26:90A(9). the licensed premises of any narcotics or habit forming drugs. La. R.S. 26:90A(11) and La. R.S. entertainment, conduct, or practices on the premises. La. R.S. 26:90A(13) and La. R.S. to play the music.) La. R.S. 26:90A(14)(a). 2. What may happen if a permit holder violates any of the above-mentioned provisions? 3. How may a citizen file a petition? requesting that a permit be suspended or revoked. La. R.S. 26: 93(C). Tobacco Control, the local Office of Alcohol & Tobacco Control, and the local ABC Board. La. R.S. consider it. La. R.S. 26: 93(D) and La. R.S. 26:290(D). 4. What is the procedure for suspension or revocation of permits? under this Chapter. La. R.S. 26: 290(A) and La. R.S. 26: 93(A). on the petition. La. R.S. 26: 290(B) and La. R.S. 26: 93(C). d. If a violation occurs, the permittee may be given a warning. La. R.S. 26: 93(A). permit should not be suspended or revoked. La. R.S. 26: 93(A). premises to the police and to the neighborhood association. Department of Revenue, who will conduct an investigation into the violations. brought against the bar owners and operators to revoke or suspend the business’ permit. accessory parking lot on a daily basis. City Code §10-136(1)(b). litter abatement program occurs. City Code §10-136(1)(d). be placed within the public right-of-way. City Code §10-136(2). 2. What health codes, building codes, and zoning requirements must a permit holder meet? consumption on or off the premises must meet all state and city health and zoning requirements. if the business complies with local building codes and zoning ordinances. City Code §10-110(a). location does not substantially comply with the local health requirements of the city and state. City Code §10-111(1) and (2). penal ordinances of the city. City Code §10- 157(a)(5). 4. Who may file a petition? 5. What is the administrative procedure once a petition is filed? of the person charged should be suspended or revoked. City Code §10-78(a). 6. What is the procedure for suspension or revocation of Permits? beverage permits and licenses. City Code §10-5(e). to him. La. C.C. Art. 667.
proportions of ownership between such identical co-owners. City Code §10-315. permit will be suspended or revoked. City Code §10-5(e). after the date of revocation. City Code §10-5(e). on the premises to the Department of Safety and Permits or the Department of Finance. and issue citations, as appropriate. permit will be suspended or revoked. determine if the permit should be suspended or revoked.